The apartment Carlo with stunning sea views is located in Karlobag at the end of a cul-de-sac quiet location right on the beach. Spend your holiday in Croatia away from mass tourism, in the private holiday home Carlo directly on the beach with the clearest and cleanest water of the Adriatic. The beach in front of the house or Garden is within easy reach. In the holiday house Carlo there are three apartments for up to six people, which offer you a nice and relaxing Croatia holiday on one of the most beautiful stretches of the Adriatic coast. The apartments are comfortably furnished, the kitchens are equipped with dishes, dishwasher, coffee maker, kettle, toaster, glasses, cutlery, etc. Bed linen and towels are provided for weekly change. The offered here in the ad Apartment Top 2 is located in 1. Upstairs and sleeps 4 to 6 people. The apartment has a fully equipped kitchenette with dishwasher, two bedrooms each for 2 persons and wardrobe, as well as living room with sofa bed for 2 persons. SAT-TV is available. The bathroom is equipped with a bath and toilet. Furthermore, there is a second bathroom with shower (but no toilet) available. 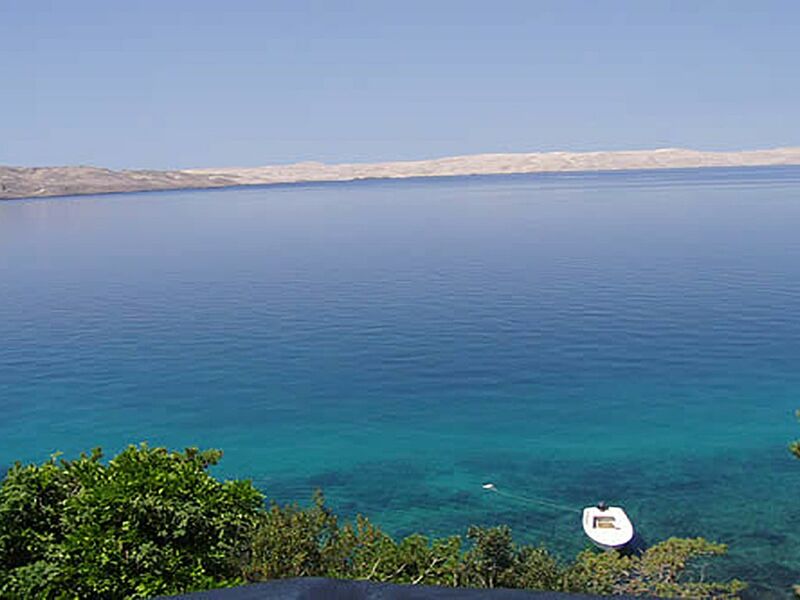 From the balcony of the apartment you have a wonderful view of the sea and the island of Pag. Air conditioning is available. Beach chairs and umbrellas on the beach available. There is also a washing machine available in the house. WLAN (Wifi) is available and included in the price. In the garden of the house you have a large, stone barbecue with adjoining terrace available, which invites to social evenings on the beach. Near the house is at the end of a small bay, a pebble beach with the beach bar Tatinja available, pictures of which can be found in the picture gallery. In addition, Karlobag is surrounded by 4 national parks, the islands of Pag and Rab, the coastal towns of Zadar or Senj and the sacred mountains of Croatia, the Velebit. Der Strand nur ein paar Schritte von der Terrasse entfernt, sehr gepflegt! Super auch die nahe Kiesbucht mit dem Bistro wenn man mal was trinken oder eine Kleinigkeit essen. Toll, dass man das Auto nicht braucht und zu Fuß in den Ort spazieren kann. Man muss nicht immer viele Worte schreiben. Das Apartment und die Lage sind einfach toll. Wir waren echt gut aufgehoben. Was für eine traumhafte Lage! Moderne und saubere Wohnung, überdurchschnittlich gut ausgestattet, empfangen wurden wir sehr herzlich mit kühlen Getränken, zwischendurch mit selbstgebackenen Kuchen verwöhnt, supernette und aufmerksame Vermieter. Der Meerblick ist atemberaubend, die Lage super, weil man wirklich alles zu Fuß in Karlobag erreicht. Die super Bewertungen hier und auf anderen Fewo-Seiten hat das Haus zurecht. Die Lage vom Haus Carlo direkt am Privatstrand ist einmalig, einfach traumhaft, der Meerblick vom Balkon atemberaubend. Die Wohnung modern und nett, sauber, alles vorhanden und wie beschrieben im Inserat auch von uns vorgefunden, das Meer kristallklar. Es war ein wunderschöner Aufenthalt bei netten Vermietern und wir überlegen schon im Herbst vielleicht wieder ein paar Tage wieder hier am Strand zu entspannen und die Sonne und das Meer noch mal kurz zu genießen. Wir haben Erholung und Entspannung gesucht und hier gefunden..in Traumlage am Privatstrand. Die Wohnung ist gut ausgestattet, der Garten und Strand ausgesprochen gepflegt. Das schönste ist der traumhafte Meerblick vom Balkon. Ein Urlaub, der uns noch lange in Erinnerung bleiben wird. The holiday home Carlo is quietly located on the beach of Karlobag directly on the beach. In addition, there are great boat trips to the nearby islands of Rab and Pag, hiking, guided mountain tours in jeep and mountain biking in the Velebit and Paklenica National Park and much more. Other worth seeing destinations are the Krka waterfalls and the Kornati islands. Klimaanlage ist nicht im Preis inkludiert- wird vor Ort bei Benützung verrechnet - EUR 5.-/Tag Kurtaxe ist vor Ort extra zu entrichten.